Signed by hand by Larry Houston (longtime storyboard artist, producer, director on a variety of animated series’, including many of Marvel’s titles such as Spider-Man and his Amazing Friends (1981-1983), The Incredible Hulk (1982-1983), among many others). Based on the style of the artwork and the character design of the Hulk, this cel is from a hulk guest appearance in the 1990’s Iron Man Animated Series. 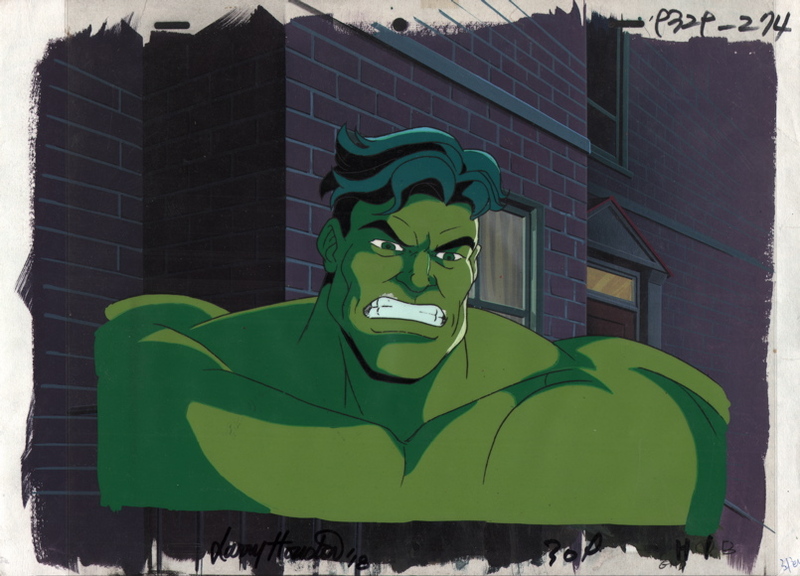 It features two cels (one with the Hulk and an overlay with the Hulk’s mouth) and a fully painted background piece (so that is three separate pieces that, placed together as they appear in the included scan, form the complete scene). In excellent condition, it will be shipped with the utmost care. It measures approximately 10 by 14 inches.